For people recovering from chronic opiate addiction, methadone maintenance treatment offers therapeutic benefits unavailable through other treatment approaches. For many, methadone maintenance treatment or MMT becomes the treatment of last resort when all other attempts at recovery fail. That being so, the risk of relapse never really goes away, especially when recovering from long-term addiction problems. For help finding a treatment program that will lead you to recovery, call 800-891-9360. Avoiding relapse while in methadone maintenance treatment has as much to do with making the most of the behavioral component of MMT as it does following methadone medication guidelines. While it may seem like methadone’s effects can relieve much of the discomfort experienced in recovery, the behavioral aspect of treatment helps you overcome the addiction mindset. Participating in group therapy can help prevent relapse. The methadone maintenance treatment approach treats chronic addiction on both a physical and psychological level using methadone as a medication therapy and behavioral interventions to help those in recovery “undo” the addiction mindset. According to Penn State University, as a medication therapy, methadone treats the diseased chemical environment in the brain that chronic opiate abuse leaves behind, much like insulin is used to treat diabetes. While methadone’s effects go a long way towards relieving residual withdrawal and drug cravings effects, the patterns of thinking and emotions that drive drug-using behaviors remains well intact. For these reasons, it’s vitally important to take the behavioral aspect of methadone maintenance treatment seriously. For help finding treatment that meets your needs call our toll-free helpline at 800-891-9360. As part of the methadone maintenance treatment approach, psychotherapy treatment helps you identify the underlying emotional issues that drive the addiction cycle while providing valuable coping skills for managing daily life stressors and pressures. In effect, psychotherapy treatment gives you a bird’s eye view of how addiction operates in your life and equips you with the tools to overcome it. While individual psychotherapy treatment works to address addiction on a personal level, the group therapy component of methadone maintenance treatment helps you develop the types of interpersonal skills needed to maintain genuine, healthy relationships with others. These types of skills can prove invaluable for maintaining healthy relationships with loved ones as well as with people at the workplace. 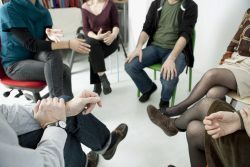 Throughout the recovery process, support group meetings offer an ongoing source of support for handling the day-in, day-out pressures that threaten a person’s recovery efforts. According to the Journal of Addiction Science & Clinical Practice, support group meetings provide a safe environment where those in recovery can vent their frustrations and receive much-needed guidance and support from those who’ve overcome similar experiences. While people in methadone maintenance treatment are required to attend behavioral treatment sessions as a condition for receiving methadone, taking an active and engaged role in the behavioral treatment process can go a long way towards helping you avoid relapse along the way. If you or someone you know are considering methadone maintenance treatment and have more questions, or need help finding treatment that meets your needs, please feel free to call our toll-free helpline at 800-891-9360 to speak with one of our addictions specialists.